MUNDIC CLEAR - RECENTLY TESTED AS 'A'. This end terrace ex local authority house lies in a good sized garden and presents great value and more than meets the eye with its surprising river views and workshop to the rear. Well proportioned three bedroom accommodation requiring modernisation with quotes from local contractors available on request. THE LOCATION Pendarves lies off Old Hill and to the rear of the river fronting North Parade. 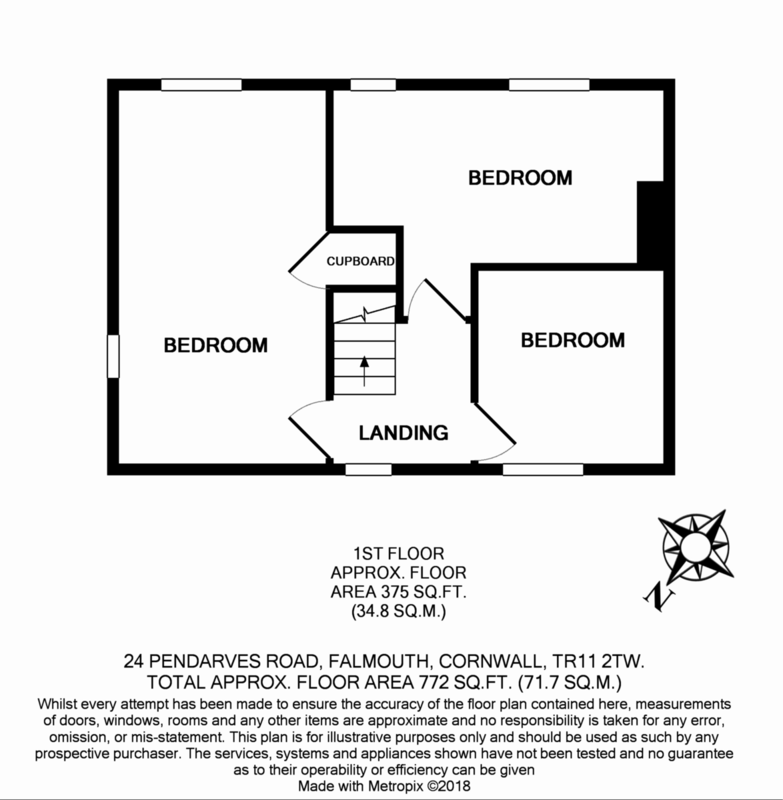 The property is just a few moments walk from Falmouth Marina and the Upper Deck restaurant whilst Sainsbury supermarket is just a few hundred meters away. Falmouth town is within half a mile, with its brilliant mix of National chains, independent shops and galleries as well as great places to eat and drink. THE PROPERTY This ex local authority house lies end terrace of four along a relatively wide road with on road, unrestricted parking. The property is unusual in several ways including an unexpectedly good view from the rear, overlooking Falmouth Marina, river and countryside. The house requires updating but has good sized three bedroom accommodation and the benefit of a gas fired boiler fuelling radiator central heating and UPVC double glazed windows and doors. The renovation required has been quoted for by two separate builders who believe the work undertaken to cost in the region of £20,000 - subject to personal taste of course! MODERN METHOD OF AUCTION This property is for sale by the Modern Method of Auction which is not to be confused with Traditional auction. The Modern Method of Auction is a flexible, buyer friendly method of purchase. We do not require the purchaser to exchange contracts immediately but grant 56 days to exchange and complete. Allowing the additional time to exchange on the property means interested parties can proceed with traditional residential finance. Upon close of a successful auction or if the vendor accepts an offer during the auction, the buyer will be required to put down a non-refundable Reservation Fee of 4.2% including VAT, subject to a minimum of £6,000 including VAT which secures the transaction and takes the property off the market. The legal Pack can be downloaded for free from the auction website or requested from our Auction Department. LOUNGE/DINING ROOM 16' 2" x 11' 4" (4.93m x 3.45m) UPVC double glazed window to front and rear with views over rooftops to river, shoreline and countryside. Open fireplace with tile and timber surround. Radiator. Cupboard. TV and power points. Picture rail. KITCHEN/BREAKFAST ROOM 16' 2" x 6' 2" (4.93m x 1.88m) widening to 8' 8" (2.64m) in breakfast area. Basic fitted units at base and eye level. Work top, stainless steel sink and drainer. UPVC double glazed window to front, side and rear. UPVC double glazed door to garden. Electric meter cupboard with trip switches. Radiator. 'Worcester' gas boiler fuelling radiator central heating and hot water supply. BATHROOM Comprising WC, wash hand basin and bath with shower over. UPVC double glazed window to rear. Radiator. LANDING UPVC double glazed window with fine views overlooking Falmouth Marina to Penryn River, Trevissome, shoreline and countryside beyond. Access to loft. Panel doors to three bedrooms. BEDROOM ONE 16' 2" x 9' 1" (4.93m x 2.77m) UPVC double glazed window to front and to side with super views to river. Deep built-in over stair cupboard. Radiator. 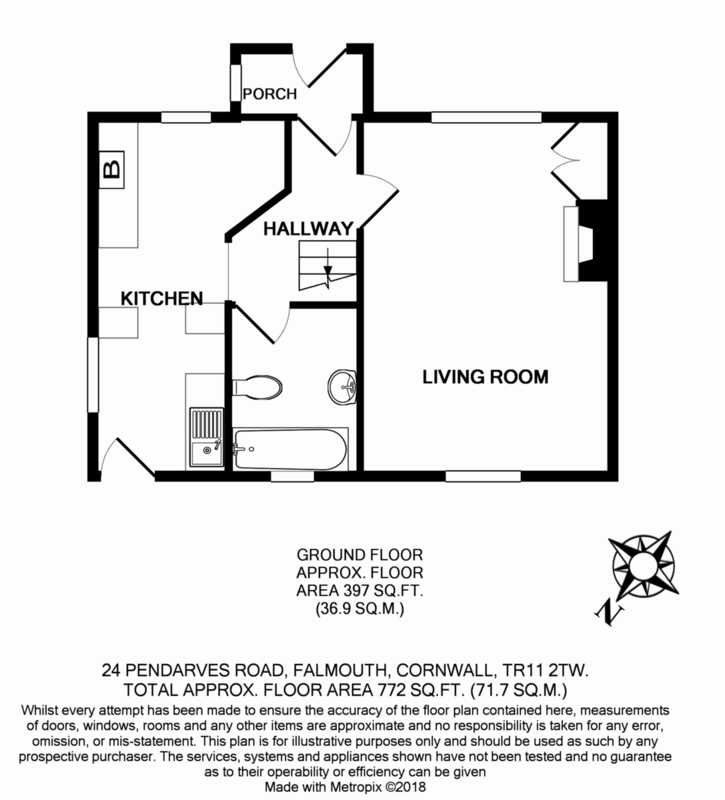 BEDROOM THREE 8' 2" x 8' 1" (2.49m x 2.46m) Super view overlooking Falmouth Marina to Penryn River, Trevissome and surrounding shoreline and countryside. Radiator. WORKSHOP 17' x 15' (5.18m x 4.57m) Block Built. Windows. Gate to rear. Tap.